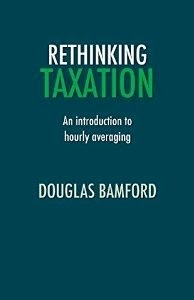 Hourly averaging is the primary idea contained in Rethinking Taxation, so it is probably a good idea to set out briefly what this means. Hourly averaging is a new way to work out what tax-rate people should pay. It therefore rivals proposals that calculate the tax rate based on the value of a particular transaction (such as most duties and consumption/sales/ excise taxes). The main rival, however, is the idea that the total amount that someone receives in a year is the appropriate determinant of someone’s tax rate (as with income tax). Hourly averaging alters this annual taxation in two opposite directions. On the one hand the horizon of the tax is increased from a single year to the lifetime of the individual. So instead of treating each year’s income separately in calculating tax, all the taxpayers’ income is included. This is not a novel proposal: the idea of multiple year tax averaging and its logical extension of lifetime averaging are longstanding proposals. The innovation comes in the other part of hourly averaging. Instead of dividing the income by the number of years that have passed, I propose to use hour credits as the denominator. People would receive hour credits for a number of reasons, but the archetypal source of an hour credit is that someone has performed an hour of work for their employer. The employer would inform the tax authority of the work done, and this would be included in their tax calculations from then on. In order to illustrate how hour credits work, consider Ginny and Humphrey who work for the same company. Ginny has always been paid £24 per hour while Humphrey is paid £8 and both have 10,000 hour credits built up over their lives. Their total lifetime incomes are £240,000 and £80,000. Ginny’s tax rate is 50% while Humphrey’s is zero percent, and so Ginny has received £120,000 lifetime net income and paid the same amount in taxation. If Ginny and Humphrey’s employer swapped their roles around their hourly average will change. In the subsequent month, they both receive 200 hour credits. Ginny’s total earnings are now £241,600 and her average has dropped to £23.69 per hour. Assume this reduces her tax rate to 49.5%, in which case she should have paid £119,592 across her lifetime. This is less than her existing lifetime tax payments, and so Ginny will receive a tax rebate of £408 along with her wages of £1,600. Her net income for the month will therefore be £2,008. Humphrey receives £4,800 gross income for the month, which increases his lifetime gross income to £84,800. His hourly average is now £8.31, which increases his lifetime tax rate to 1%. His lifetime tax is therefore £848 and he receives £3,952 in net income for his month’s work. It may appear that the tax system is extremely generous to Ginny and Humphrey at this point in time. Humphrey’s tax rate does not rise to the level that Ginny was paying and Ginny receives a tax rebate for her past tax paid on top of her wages. This is in fact an advantage of hourly averaging from the perspective of taxpayers; it smooths out people’s net income over time. Once Ginny and Humphrey have had their new jobs for 10,000 hours they would both have received £320,000 in total and have an hourly average of £16. They would have the same tax rate at this point; which I will say is 20%. However, as time goes on with their new income Humphrey’s tax rate would increase while Ginny’s rate would drop. After 100,000 hour credits Humphrey’s average would be £22.40 and he would therefore have a lifetime tax percentage in the high forties. Taxing people in this way means that a lot of revenue can be generated from the most economically fortunate (those who make use of their talents or position to earn economic rents) and shared to those who work hard but for low pay. No other proposal promises to do this. Furthermore, calculating tax in the above manner would mean that everyone would want more hour credits. After all, this would reduce their tax-rate for any given amount of income. Hour credits would effectively represent additional income to their recipients; each person would know that they receive x amount of money whenever they get an additional hour credit. This means that people will have a strong incentive to work longer, counteracting the common complaint that taxing the fortunate and assisting the less fortunate discourages people from working. Hourly averaging is a proposal that utilises the advantages of the market economy such as the incentives to produce and consume in the most efficient way. However, it counteracts the inequities that market economies perpetuate; that some do very well while others struggle. The above description and examples present a simple example of how the proposal would work. More detail on the proposal and responses to various concerns can be found in Rethinking Taxation.